Cape Buffalo are impressive animals, especially the males. There is great deal of attitude here, especially from the big bull in the front. Quite often you’ll get a bachelor group like this. Two or three big, male buffaloes that have separated from the herd. They are outstandingly impressive animals, particularly when you get up close. Finding buffalo or elephant in the stunning Matusadona wilderness area is always a treat. The combination of mountains, powerful animals, water, reflections and egrets makes a magical scene. 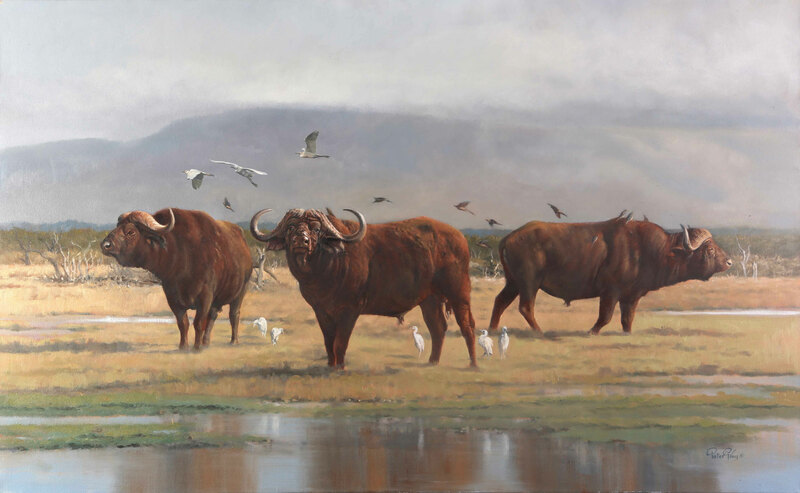 Description: Cape buffalo and egrets.